A lot of startups and technology companies focus on acquiring new users. You hear terms like growth hacking, viral marketing, and growth velocity. But while many are doing a great job mapping out their marketing funnel, they fail to realize that the customer journey doesn’t stop there. Although growth is great, making sure that your users stick around is just as important. If you fail to get users to engage with your product, it will eventually fail when trends turn. It’s like the tortoise and the hare: if you only focus on growth, you may see an exciting burst of success only to be followed by painful stagnation or decline. 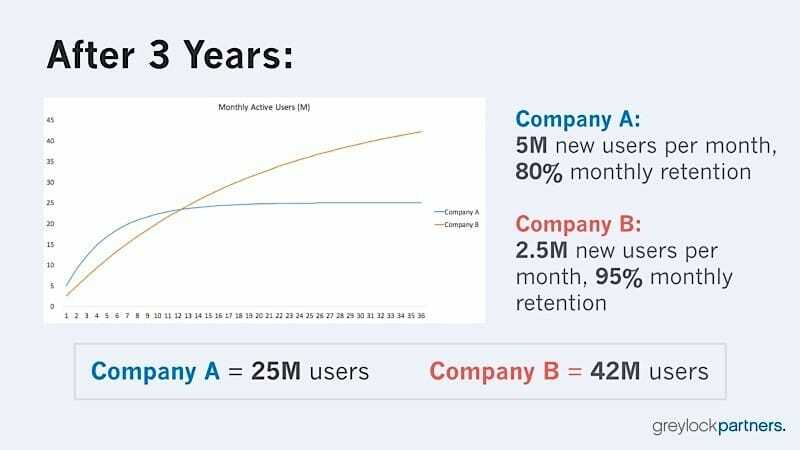 With half as many new users acquired each month, Company B greatly outperforms Company A after 3 years with monthly active users – a key metric for many apps and SaaS products. It just took a modest improvement in user retention. So how can we build a sticky product and avoid the dreaded Silicone Graveyard? Games are a great example of sticky products. People will spend hours glued to their screens. They’ll do anything to beat the level, pass their friends, and earn rewards. They’ll miss their subway stop, they’ll forget to eat, they’ll even walk into a tree. With the most engaging games, you even see people spending serious money just to unlock new challenges and power-ups. 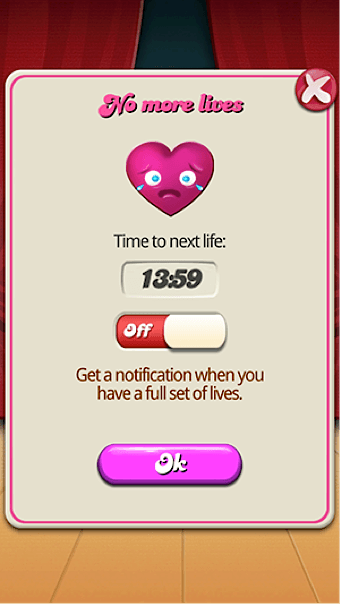 A lot of product designers try to “gamify” their apps by adding badges, rewards, points, and scoreboards. But it really isn’t that simple. Most people don’t play games just to earn virtual points and badges. These are simply visual representations of something more meaningful to the user. A good game designer knows this. These elements are merely tools, not the main focus. Holly explains that the best game designers focus on the “core loop.” This is the main action and focus of the game. For a role-playing game (RPG), it would be your character; for a puzzle game, it would be solving it. Take a moment to think about the core loop of your product. What is the central reason that people would engage with it? This is easier for some products than others. For example, most social platforms are focused around a newsfeed. 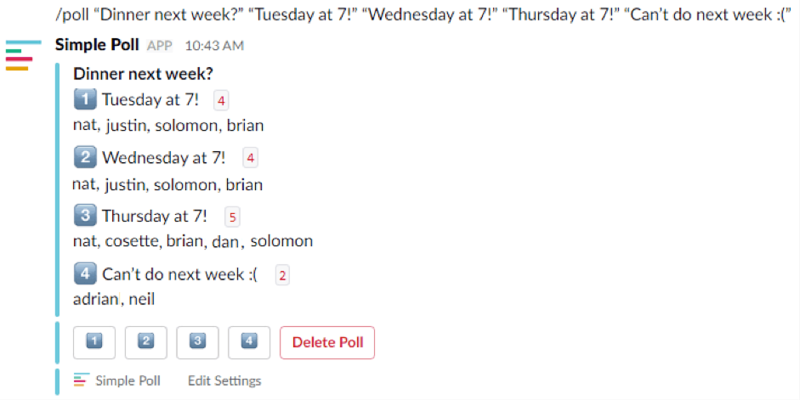 Slack is focused around conversation. Before anything else, you need to make your core action as awesome as possible. Never sacrifice its quality for any reason. All these rituals are focused around the core loop of “tasks.” Make sure that the user is investing daily in the most important aspects of your product and build a ritual of habit that will keep them coming back. When you add new features, integrate them with your core function. Slack is an excellent example of this. 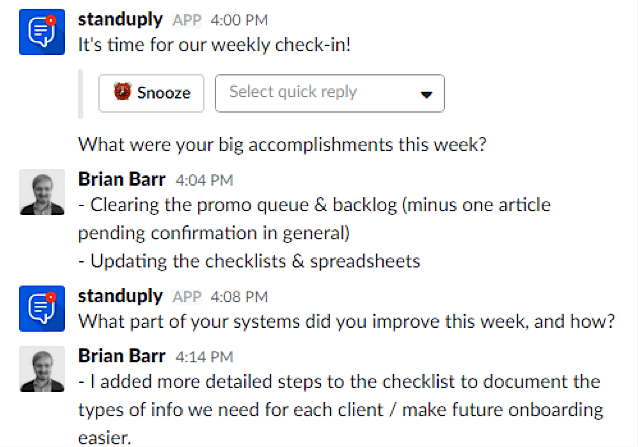 A good slack extension is designed as a chatbot or comes paired with keyboard commands so you can access it quickly in the flow of conversation. Both of these features do their job without asking the user to break from their normal habits. Rather, they build on the core loop of conversation – thereby strengthening its value. These rituals are critical in our next step. A sticky product improves as the user continues to interact with it. Sarah Tavel at Benchmark Capital calls this “Accruing Benefit,” and she outlines two ways a product can accrue benefits – explicit and implicit. Explicit benefit accrual is achieved by incentivizing the user to enhance their own experience by investing in the product. The network effect is an easy example of this. Social networks encourage you to connect with more friends to increase the value you obtain from logging in. 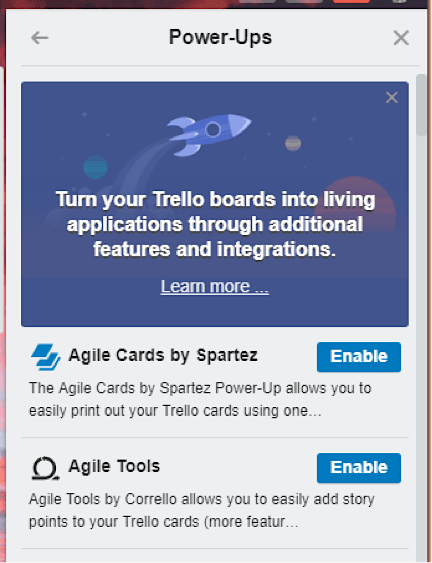 Going back to productivity tools, Slack or project management software like Trello encourages this by prompting you to connect your other tools to the platform to simplify your workflow…and make it more dependent on them. Implicit benefit accrual is a bit more sly. It focuses on collecting data about the user’s behavior to optimize their experience and make it more engaging. The classic example here is how Facebook filters your newsfeed based on the content you are most likely to engage with by tracking your reactions, comments, and posts. Or how Netflix recommends films based on your viewing habits and reviews. Think about it – if you logged onto Netflix and didn’t see anything that looked interesting to you, would you stick around? Or would flip over to YouTube in hopes of a more engaging experience? These companies excel because they’ve invested millions in customizing their experience to your tastes. As your user invests more into the product (both explicitly and implicitly), it should start to become more and more indispensable. Tavel calls this “Mounting Loss,” as the cost of leaving your product rises the longer customers use it. This is a natural effect of accruing benefit. As Netflix continues to learn your tastes, their recommendations improve. If you were to log into Hulu for the first time, you’re a lot less likely to see something that grabs your attention. Even if the content is there, it’s just so much easier to go back to Netflix where it’s all laid out specifically for you. In addition to this level of personalization, there are a few other ways to make your product feel indispensable. Build a tribe or brand around your product that the user identifies with. Instagram does this well by being more curated than most social platforms. Users showcase who they are (or who they want to be) and losing that could be devastating to their sense of self. While that level of identity may be difficult to achieve, you can get close by building a strong tribe around or within your product. Create Facebook groups like Teachable’s “The Teachable Tribe” where your users can collaborate, share inside jokes, and make friends. This type of community – and your product – can be hard to leave. Going back to our example of Trello and Slack, the more tools that your users integrate with your product, the more difficult your product will be to replace. Encourage your users to rely on you by making it easy and valuable to do so. Focus on making it simple to integrate your product into their day. Think about what other tools your ideal customer is using and figure out if they could benefit from connecting those with yours. This is also where the daily rituals are of great importance. Even if your product doesn’t lend itself into integrations, you can still make it a critical part of the users’ day by building a powerful usage habit. Candy Crush may not integrate with your e-mail or calendar, but if you play every day on your morning commute, lunch break and before bed, it may feel as natural as brushing your teeth. This doesn’t happen by accident. This game times how fast your lives reload so they can build a playing habit throughout the day without burning out all your interest in one sitting. And to incentivize you to spend some money on power-ups, of course. Failure to do this is one reason that Pokemon Go didn’t stick. Players were obsessed 24/7 – for a time. Then it stopped being fun. While you want people to use your product as much as possible by developing daily habits around it, it’s important not to burn out their interest. Sticking with the game example, RPGs achieve this through leveling up your character, so every challenge you overcome makes you stronger. To quit the game would be to give up all that progress and time you put into it. Translating that to the business world, platforms like Shopify encourage their customers to customize their store, add extensions, and learn advanced features. They do their best to make the process fun and easy, but it’s still a time investment. 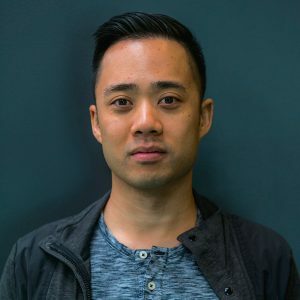 Even if a competitor like BigCommerce came out with a killer new feature or a better pricing plan, few users would drop everything that they spent the past two years building to switch. To get users to spend a lot of time investing into your product, you need to be customizable and include advanced features that encourage constantly learning and exploring. But on the flip side, you also need to keep those processes simple and easy. If the perceived investment is too high, users won’t want to try. Make sure you provide the support and community to help customers dive deeper into your product. The goal is to encourage them to invest time into your product by showing them that the additional reward is greater than the additional effort. Over time, that reward begins to accumulate, making it feel costly to leave. Growth and stickiness go hand-in-hand: one without the other is a waste of time and money. 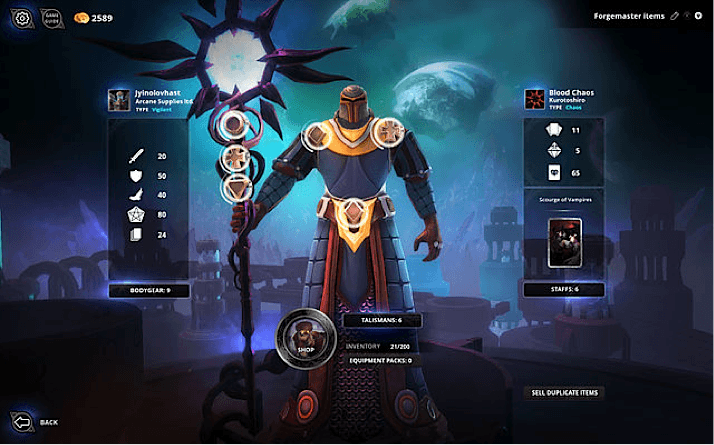 When designing your product or next feature release, remember to think like a game designer and build with the goal of driving your customers to invest in your product so you can deliver an improved experience and make it harder to leave. They say the best things get better with age. Make your product one of them.